Editor’s note: Each year since 2005, Shorts International and Magnolia Pictures have released a program of the Oscar-nominated short films. Starting Friday, this year’s trio of programs–live action, animation and documentary–play at over 200 theaters across the United States and Canada. While checking out the shorts can provide you with a leg up in Oscar pools, the shorts are also an opportunity to catch an alternative to the starry, glamorous features that dominate most other categories. The current nominees address a number of themes and causes. Here’s a rundown of the live-action shorts. Stay tuned for coverage of the animation and documentary contenders this week. The live-action category is often a place where new talent gets recognized, a trend most recently typified by last year’s win for the hipster comedy “God of Love,” which brought the irreverent comic style of Luke Matheny to overnight national attention. This year, the sole U.S. competitor seems less likely to take the top prize, but contains the same brand of offbeat romantic comedy that propelled “God of Love” to such acclaim: “Time Freak,” directed by Andrew Bowler, stars Michael Nathanson as an obsessive young scientist whose time machine has lead him down endless rabbit holes as he fine tunes a single day of existence. In the grand tradition of “Groundhog Day,” he simply can’t stop revisiting small moments in a vain attempt to perfect each one, from an argument at his local laundromat to the infinitely awkward discussions he has with a neighborhood crush. When his levelheaded pal (John Conor Brooke) figures out the obsession, he makes a desperate attempt to put a sudden end to it. Amusing but no more substantial than an accomplished “Saturday Night Live” short, “Time Freak” is the weakest achievement of the category. The only other outright comedic entry, the Irish “Pentecost,” follows a disgruntled altar boy (Andrew Bennett) whose obsession with football gets tackled by a trenchant priest, who insists the child abandon his athletic ambitions in favor of religious ones. A competently assembled 11-minute piece, “Pentecost” owes its entire allure to a hilarious final shot, when the rebellious star finally gets his wish. But it’s also a reminder of the droll, unremarkable quality of everything leading up to that climactic moment. 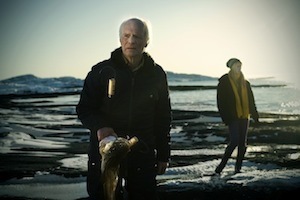 On a more pensive note, “Tuba Atlantic,” from Norway, focuses on Oskar (Edvard Hægstad), a cantankerous old man who discovers he has six days to live. While dealing with a young “death angel” (Ingrid Viken) tasked with helping him cope with his final moments, Oskar plots a bizarre attempt to reconnect with his brother in Ireland by using a gigantic tuba affixed to the roof of the dying man’s seaside home. A whimsical tale of mortality that builds to a bittersweet (if inevitable) finale, “Tuba Atlantic” reveals writer-director Linn-Jeanethe Kyed’s eye for a combining simplistic narrative with profound ideas. The tamest of the nominees is unfortunately, at 30 minutes, the longest of them. “The Shore” is a low-key, character-driven story from writer-director Terry George (previously an Oscar nominee for his “Hotel Rwanda” screenplay) in which a middle-aged man named Joe (Ciarán Hinds) returns to his Northern Ireland town to reconcile a longstanding difference with his childhood friend Paddy (Conleth Hill). Reunited by Joe’s daughter, the men eventually meet under unlikely circumstances and exchange a few words, but revealing those details would spoil the biggest surprise “The Shore” has to offer. Everything leading up to that moment is quiet, talky and relatively unmemorable. In a complete tonal contrast, the frantic German short “Raju” follows a couple attempting to adopt a young Indian child and learning, by accident, that he has been kidnapped from his parents. While some viewers may consider the touristic POV of Indian poverty to veer dangerously close to a racist waters (echoing the “Slumdog Millionaire” backlash), there’s no denying the suspenseful quality of writer-director Max Zähle’s competent thriller, which owes much to the subtle performances by lead actors Wotam Wilke Möhring and Julia Richter, who play the adoptive parents-to-be facing a horrifying decision. WHO WILL WIN? “Raju” is the only nominee weighted with topicality, which often gives a film a leg up with Academy voters. However, “The Shore” engages with the major themes of death and making amends with one’s previous mistakes, channeling them with a surprisingly light, amusing perspective, which positions it as a reasonable competitor. Unless the two cancel each other out, the gold statue will likely go to one of them.